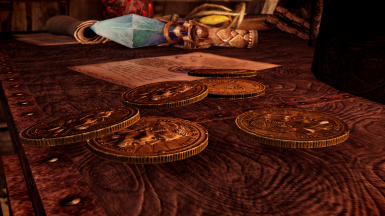 A high quality Septim (coin) retexture mod by Hvergelmir. Comes with 3 different colors to pick from. 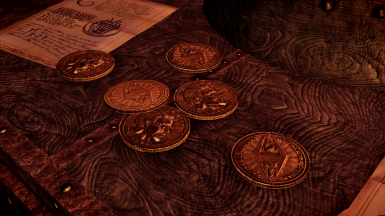 Made using the The Elder Scrolls IV: Oblivion collector's edition coin. Hvergelmir Mods quality stamp. A simple Septim retexture made by Hvergelmir, coming out of nowhere. 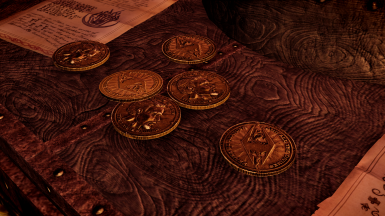 I made this retexture by shooting some high quality macros of the The Elder Scrolls IV: Oblivion collectors edition Septim coin. I shot all the light angles for the normal map the same way, for the most optimal and realistic light. This is also a slightly easier approach, than having to model the high poly coin from scratch, which is doable, but not as fast as this method. I decided to provide 3 different color variants. The original gold texture, with a slightly more realistic hue, a silver (desaturated) variant and a copper/bronze version (warmer than gold), so you can pick whichever you prefer. Vanilla Septim textures (Legacy Skyrim) are 256x128 px. 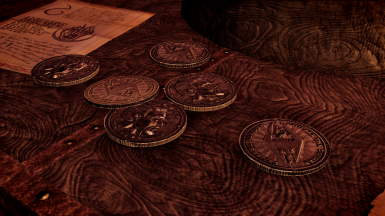 Septim - a coin retexture Ultra pack at 2048x1024px and are mostly targeted towards screen archery. 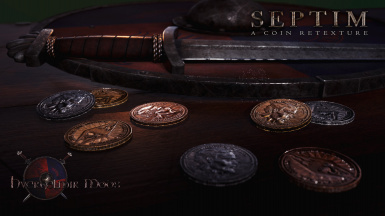 Septim - a coin retexture High pack at 1024x512px and is recommended for the average modern rig. Then there's the Low pack at 512x256 and is recommended for lower end pcs. It is recommended to install Septim with Vortex Mod Manager, it simplifies the process greatly and also makes it simple to deactivate or uninstall again if needed. Septim now come in a Fomod installer to make installation even easier. If asked to override, click yes. 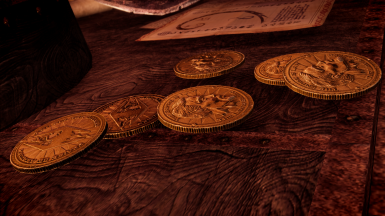 Please keep in mind this will override any other coin (re)textures you currently have installed. Read my profile page if you want to know more about me, or find my other mods.